Tushar in the Crusher race.Photos by Chris See. Once a year this show allows the public a look into the mind of the custom frame builder. In addition to the bikes the show includes builder tools and fixtures as well as fabrication supplies including tubes and castings. 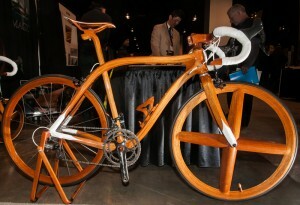 Cycling Utah visited the show and visited with three builders with ties to the Intermountain West. of family have practiced the craft. Photo: Brian See. First stop, Kelson Cycles from Ashton Idaho. Kelson Cycles' Brian Williams started road racing at age 14. At the time, Williams had the habit of constantly tearing his bike apart. He found the rebuilding to be more challenging than disassembly thus the bike frequently ended up in piles on the floor. Unable to reassemble the pieces into a complete, functioning bicycle, Williams and his mom headed off to the local shop on a regular basis. After multiple trips, and many hours hanging around the shop, they put Williams to work. His career as a mechanic and framebuilder began. The shop had a resident frame builder, and Williams soon gravitated toward building bikes. He first learned to weld steel, and then, moved on to titanium. Thanks to his long experience, Williams’ welds are clean and well executed. Initially, Williams built bicycles for fun and for his friends. But he has since made it his full-time job and has opened a studio in Ashton, Idaho. Along the way, Williams also did a stint building kayaks, which gave him experience in working with composites such as carbon. 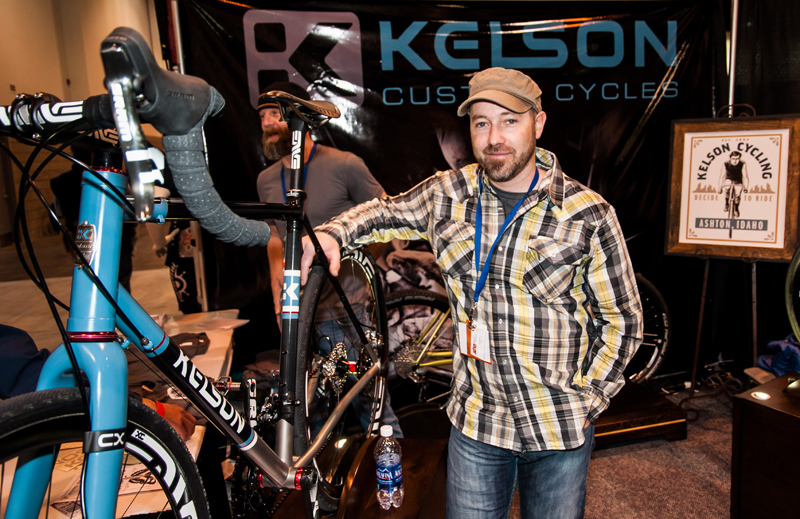 Kelson Cycles was born of Brian's frustration with the one-size-fits-all approach that dominated the products he sold in the shop in Rexberg, Idaho. At NAHBS, Kelson showcased a mixed titanium and carbon fiber frameset designed specifically for Utah’s Crusher In The Tushar race. Taking place in July, the Crusher in the Tushar runs over paved and gravel roads, and the course makes unique demands on the competitors’ bikes. Williams named his Crusher bike the RAD: Road, asphalt, dirt. 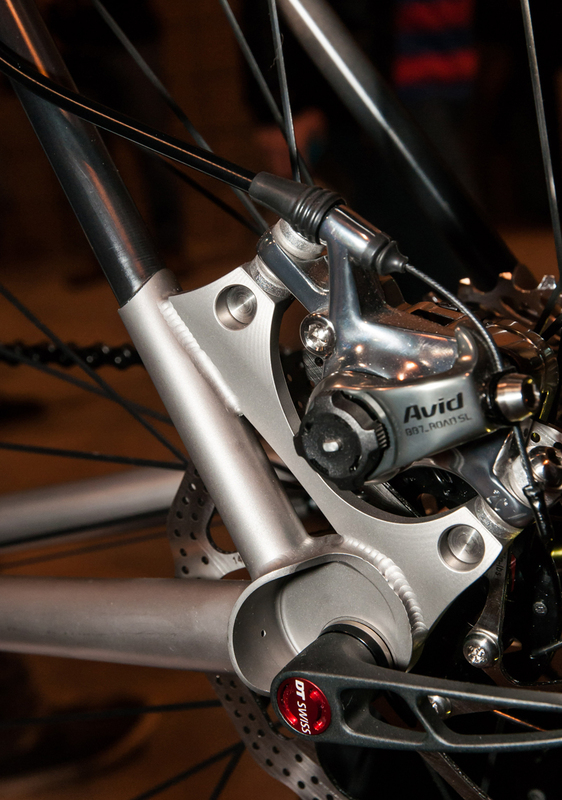 The titanium rear dropout of the RAD is finely crafted, and connects the carbon seat and chain-stays. Photos: Chris See. Kelson’s RAD bike is half titanium and half carbon, with the titanium on the lower portions of the bike. The bottom tubes around the bottom bracket and chainstays are titanium while the top tube and seatstays are carbon. The titanium lower frame elements protect against rocks and other impacts that might damage the carbon. The titanium chainstay also allows for integrated disc mounts, which saves weight. The carbon, meanwhile, lightens the overall weight of the bike and offers some high-frequency vibration damping. 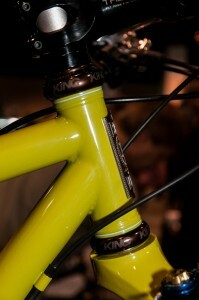 Titanium lugs join the two frame materials. Born of Williams’ exploration of the mixed road surfaces of southeastern Idaho, the RAD is a subtly tuned cyclocross frame. 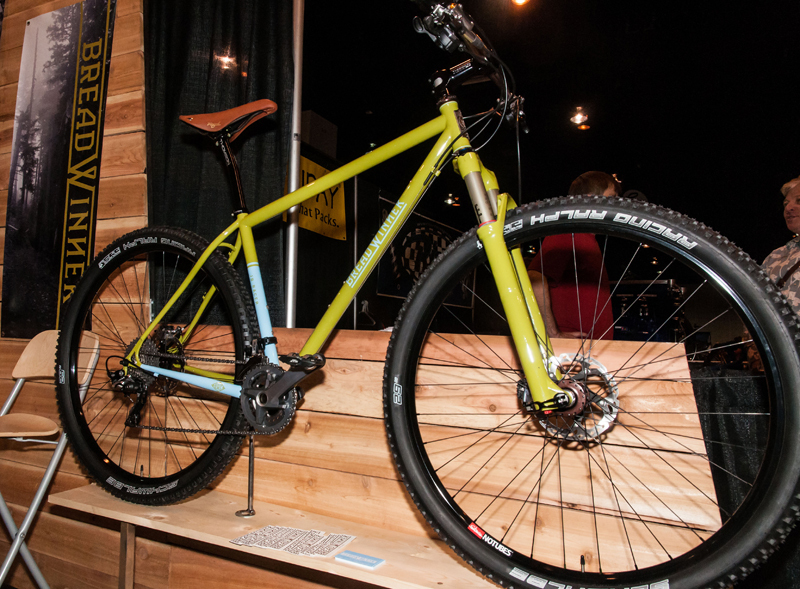 The geometry aims to make a bike up to the demands of on and off-road riding. The front end of the frameset is based on road geometry. The fork has a 59mm trail, which Williams intends to provide more reponsive steering. Williams also drops the bottom bracket to 70 mm which places rider down lower on the bike. The lower position aims to improve the bike’s stability. Williams finishes the design with 425mm chainstays, which he borrows from traditional cyclocross designs. Williams has built up his RAD bike with SRAM Force. The wheelset, bars, and stem come from the carbon wizards at Utah’s ENVE Composites. The Kelson Crusher bike also features disc brakes. While the true weight is still a secret, Williams allows that it's approximately 18 pounds. 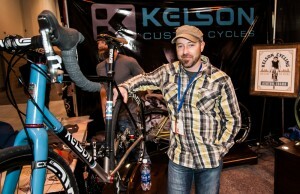 The Kelson display at NAHBS also included a 650b steel hardtail and a full-carbon road bike. For more information, visit: kelsonbikes.com. The next Utah connection is Park City-based Chris LaCasce and Scrub Components. Scrub builds disc brake parts. Scrub’s products include pads, rotors, and rotor-carrier assemblies. The company’s focus is on improving heat dissipation which increases component stability. To this end, Scrub has developed the “Chill” heat sink. The “Chill” is integrated into the backing plate of the brake pad. The Scrub-designed pads currently fit four calipers: Old Shimano, New Shimano, Elixir, and Formula. Scrub makes it brake pads in the U.S., and the design aims for a soft, quiet braking surface. Scrub also makes a two-piece rotor. The U.S.-made rotors feature the rotor and carrier as separate pieces. The outer braking surface is separate from inner carrier ring, which is mounted to the hub. The Scrub design controls warping and improves heat management under prolonged braking, because while the mounting ring remains stable, the rotor can expand as it heats. Scrub offers their rotors in a variety of materials to meet the weight and durability needs of individual riders. The design also allows the carrier to be made in colors without affecting the rotor. The machining of the rotors is performed in Seattle, and the final assembly and production work is completed in Salt Lake City. For more information, visit scrubcomponents.com. Tony Pereira (left) launched Breadwinner at the NAHBS. Photos: Chris See. The third stop was a conversation with Tony Pereira of the newly launched Breadwinner Cycles. Currently working out of Portland Oregon, Pereira began his career as a frame builder in the Salt Lake Valley. Pereira is a self-described tinkerer. “Ten years ago I was a bike mechanic, living in Salt Lake City, and I had a torch,” he told Cycling Utah. He put that torch to use and created an assortment of different bikes during his early years as a builder. Among his creations were tall bikes, a cargo bike with a front platform, a motorcycle, and a pioneering 29-inch mountain bike. Pereira rode and raced his own creations in the Utah Intermountain Cup series for several years in the nineties. Completely self-taught, Pereira focuses on clean lines and straight-forward designs. Pereira’s career was given a boost when he was able to acquire the inventory and fixtures of Rogue Cycles. Pereira’s first original bike design was a 29 inch MTB at a time when ‘niners had not yet gained any traction in the industry. At the time, he was working at Wild Rose Mountain Sports with local mountain bike racer, Jeff Bates. Pereira got to thinking about trying out a niner. Why not build it himself? Pereira and Bates raced Pereira’s first builds in the Utah Intermountain Series. Tony's first ever bike sale was to a racer at the ICup. Smooth welds are the norm for Breadwinner. Photos: Chris See. Today, Breadwinner designs offer aesthetically clean, TIG-welded steel framesets. 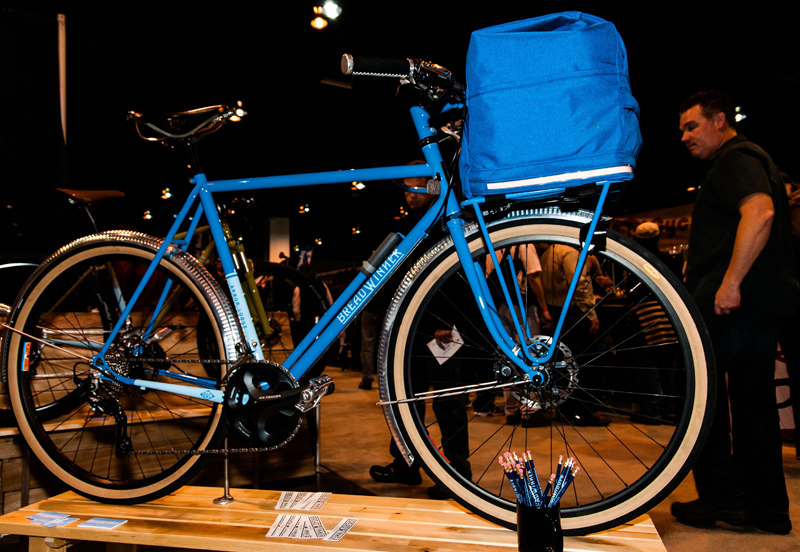 The Breadwinner line-up includes road, cyclocross, mountain, and commuter designs. The Arbor Lodge commuter perfectly illustrates Pereira’s complete and clean ideal. 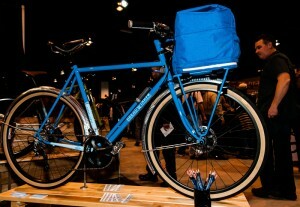 It features an integrated U-lock, a generator hub that powers built-in lighting, and an integral rack. The rack includes a specifically designed bag that has an illuminated strip for 270º visibility. Pereira has stayed true to his mountain bike roots. This year, the Breadwinner 29er commemorates the life of Pereira’s friend and collaborator Jeff Bates. Bates, a fixture of the Utah cycling community, died in 2011 of melanoma. The Breadwinner 29er carries the name JB Racer in Bates’ memory. The JB Racer is a steel hardtail and showcases the clean welds and a simple frame aesthetic that characterizes Pereira’s designs. Breadwinner is a partnership between Pereira and Ira Ryan based in Portland Oregon. Ryan handles road designs for Breadwinner. For more information, visit breadwinnercycles.com. 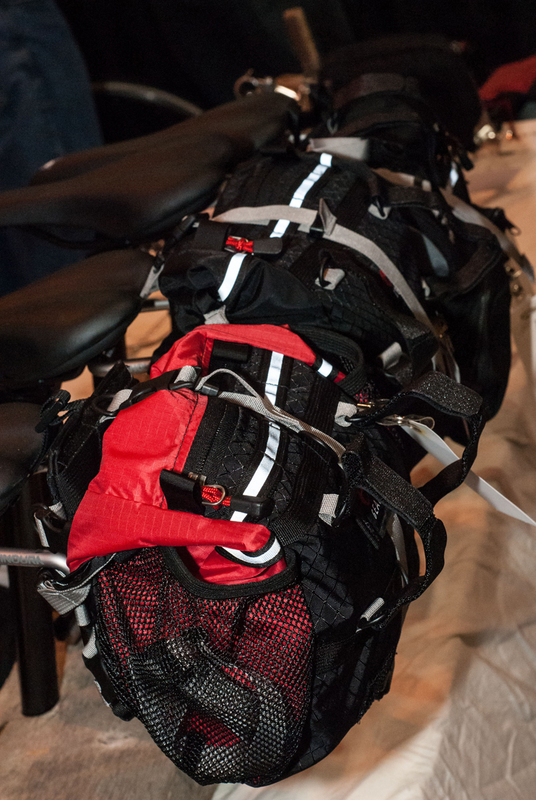 EO Gear's seat bag has extra capacity for randonneuring.Photos: Chris See. Also at the show was EO Gear. Richard Stum is the mind behind EO, a fabricator of bicycle bags. Designed and sewn in Utah the product line starts at small top tube bags for triathletes and runs to large saddle mounted bags for the Brevet (a long single day self-supported road ride) rider. The smaller bags attach with simple hook and loop straps. The larger saddlebags have a dedicated rigid mount to support the bag. This allows bag to be removed while the mount stays firmly attached to bike. For more information, visit eogear.com. 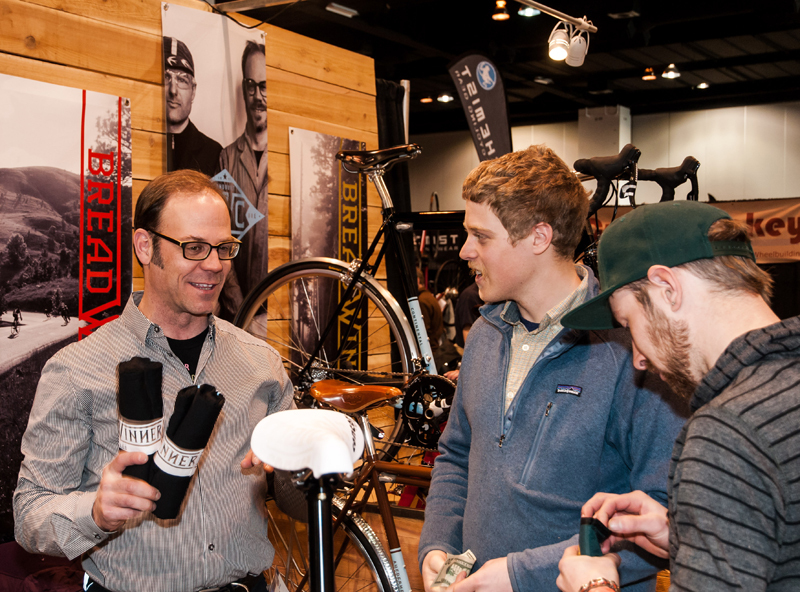 From TIG-welded steel commuters to bamboo-titanium hybrid fat tire mountain bikes, NAHBS had something that drew the eye of any cycling enthusiast. Be it large shops or individuals working alone, the show was a gathering of the unique, the aesthetically pleasing and everything in between. Whether one was looking for a set of steel frame lugs, or a complete frame builders fixture, it was all on display in Denver.